We offer some of the finest bloodlines and stud dogs in the world. No matter what you are looking for, we should have the dog that can produce that characteristic. 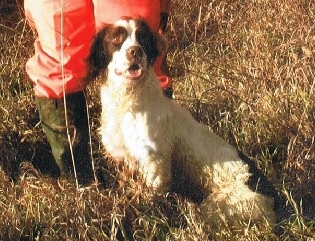 CHOPPER: (L/W 43#) Chopper is an exceptional Springer Spaniel. He is an excellent marker, Big Running, and VERY flashy. 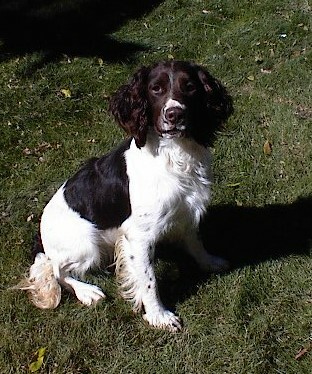 He finished the 2002 Field Trial Season as 2nd Place High Point Puppy, and became a CFC before his second birthday. 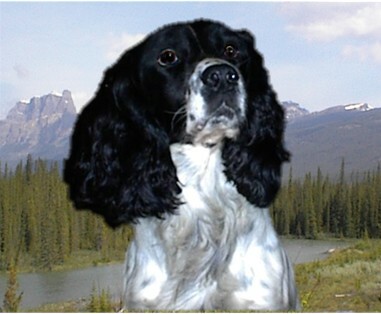 He finished 2003 as 2nd high point open dog in Canada, and ran in the 2003 Canadian Open All Age Nationals. Chopper is now available for Stud in the USA. Chopper produces puppies with tremendous drive and desire, with a willingness to please. WILLOW: (L/W 45#) Willow is a well rounded young dog showing a great deal of promise. He did quite well in AKC puppy stakes, and is currently competing in all age stakes. He has a strong run, an excellent nose, and is showing great marking ability. Not only is Willow a excellent competitor in the field but he has very good confirmation and type. He has received two of the three legs required for the title of International Champion, with the highest rating possible. BRITT: (B/W 48#) Britt is a distinguished English import with a thunderous run. Sire and Dam are both English Field Champions. He has competed in 7 Nationals, is a Canadian Field Champion, and has a win and placements in the US. Brit produces puppies with a lot of talent and composure. It's Born in the Blood...It's the "Breeding, and It's the Training, and It's Something Unknown"